The Bilohirsk reservoir of the occupied Crimea has almost completely dried up. Once the largest reservoirs of the peninsula is now partially covered with grass. 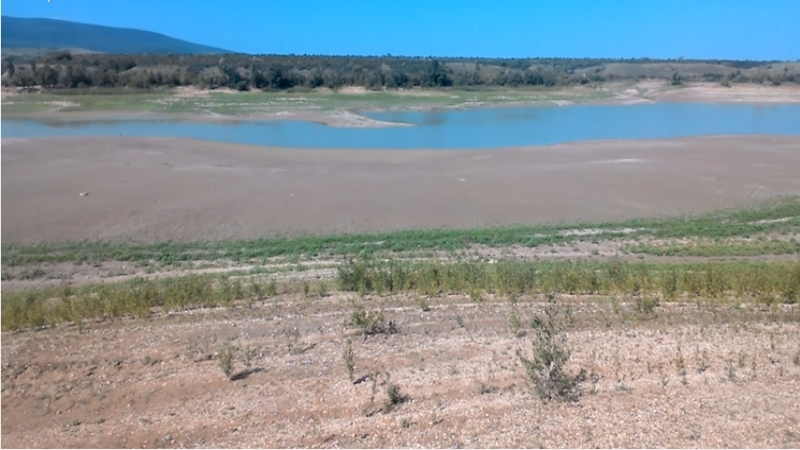 The channel of the Biyuk-Karasu River near the village of Karasivka above the Bilohirsk reservoir is drying up as well. “Heavy precipitation did not save one of the largest rivers of Crimea – Biyuk-Karasu from drying. I can confirm it after personally going to the upper reaches of one of the largest reservoirs of Crimea - Bilohirsk reservoir. And what I saw there was worse than the unpleasant expectations. The channel of the Biyuk-Karasu River near the village of Karasevka above the Bilohirsk reservoir was completely dry. Now it is clear why the reserves of Taiga and Bilohirsk reservoirs were exhausted on July 5, and the discharge of water from them was stopped. After all, without the inflow of water from Biyuk Karasu, the reservoir is left without supplies,” noted the author in a commentary to the video. Earlier, the occupation authorities of the Crimea stated that in the reservoirs of the annexed peninsula water supply to the Crimea will be enough until the end of 2018.